In front of Lorenzo`s inn, in Barcelona,a holiday crowd has gathered. Here, too, is the merry flirt, Quiteria, the daughter of the innkeeper, and her lover Basil, the barber. To tease Quiteria, he is over-attentive to her friends. Lorenzo catches his daughter kissing Basil and forbids them ever to meet again; he won`t have any penniless suitors.In vain Quiteria tells her father how much she loves Basil, Lorenzo is inexorable and turns the barber out of the house. Camacho, a rich pompous nobleman, walks in, resplendent in his brocaded clothes. The crowd jeers at him. He has come to ask for the hand of the beautiful Quiteria. Lorenzo is happy to have so highborn a gentleman for a son-in-law, but to Quiteria the idea of marrying him is detestable. The innkeeper is shocked at his daughter`s impertinent manner of behavior to Camacho. A street dancer enters, cheered by the crowd. The girl is eagerly expecting the arrival of Espada, the famous toreador. Espada makes his appearance, accompanied by other toreadors. They dance, flourishing their cloaks, enacting scenes from a bullfight. At the appearance of an extraordinary-looking horseman the people are struck with astonishment. Sancho Panza blows a horn to announce the arrival of the knight-errant of La Mancha. Lorenzo welcomes the traveler courteously and invites him to have some refreshment. The girls seize the opportunity to have a bit of fun by playing tricks on the fat squire. They start a game of blind - man`s- buff. After that, the poor harried Sancho becomes sport for the men who toss him up into the air. Sancho screams for help. Don Quixote comes to his rescue, armed with a huge toasting-fork and a plate for a shield. The knight sees Quiteria and is struck by her beauty. Was it not she who haunted his dreams as the beautiful Dulcines? In rapture, Don Quixote ends his knee to her and asks her to dance a minuet with him. To annoy Basil, Quiteria graciously accepts the invitation, coquettishly imitating the manners of a fine lady. While no one is looking, Sancho steals a fried fish from the kitchen and is about to slip away, but the scullions give chase and catch the thief. Amidst the general confusion, Quiteria and Basil slip away unobserved. Fleeing from Lorenzo and Camacho, the two lovers, Quiteria and Basil, wander into a gypsy camp. The gypsies dance for their guests. A girl informs them of the approach of a queer-looking horseman, Don Quixote. Basil and Quiteria meet him like good old friends. The gypsies invite Don Quixote to attend a play they are about to perform. He takes what is going on upon the stage for actual facts, and rushes, sword in hand, to rescue the unhappy heroine; the improvised theatre is destroyed. The frightened actors and spectators scatter in all directions. The turning sails of a windmill, then, catch Don Quixote`s eye. They are the arms of giants! Don Quixote attacks the windmill. His clothes get caught on a sail; he is first swung up into the air, then hurled to the ground. Quiteria and Basil attend to his injuries. They spend the rest of the night near the gypsies` caravan. Don Quixote is tormented by a nightmare. In his sleep he attacks the monster boldly and overpowers its at the same moment the forest in transformed into the bright Kingdome of the dryads .Among them is Quiteria who has assumed the form of Dulcinea, the queen of his heart. Cupid presents Don Quixote to the Queen of the dryads. The nymphs are grateful to him for rescuing them from the power of the monster and dance for their deliverer. Dawn breaks, Quiteria and Basil wake up only just in time, for Lorenzo and Camacho, are close upon them. The lovers flee. Don Quixote, their protector, sends Lorenzo and Camacho on a false trail. People gather for a fiesta at an inn. Quiteria and Basil, having given the slip to Lorenzo and Camacho, have also come here to take part in the merrymaking. The toreador and the dancer, Mercedes, enter, hailed heartily by the crowd. The innkeeper warns Quiteria of her father`s approach, Quiteria tries to escape, but her father overtakes her and drags her to Camacho to give them his parental blessing at their betrothal. Camacho kneels before Quiteria. Basil, seeing this, stabs himself and falls to the ground. Quiteria rushes to him. She guesses at once, that he is feigning, but the sly girl begs Don Quixote to go to Lorenzo and persuade him to grant Basil`s dying wish - to give them his parental blessing. Basil is sure to die. Why not ease his last moments? Camacho protests, but is driven out unceremoniously. 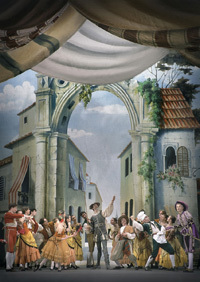 At Don Quixote`s earnest entreaty, Lorenzo blesses the lovers. The next instant. Basil jumps to his feet and kisses the astounded Lorenzo. The merrymaking at the inn continues for a long time. Lorenzo, assisted by the scullions, the maid servants and Quiteria`s friends, is completing preparations for the wedding feast. Don Quixote is the guests of honor. Lorenzo keeps wondering how Don Quixote has contrived to deceive him, to make him reject the rich suitor and let the poor barber marry his daughter. The innkeeper, donning a suit a of armor, challenges Don Quixote in jest. Don Quixote bravely takes up the challenge of the Unknown Knight, but falls to the ground the moment their swords cross. The merrymaking goes on. The happy lovers dance for Don Quixote,to whom they owe their happiness. Now, that his benevolent mission is completed, the knight- errant maygo on his way. He rides off, amidst shouts of gratitude.